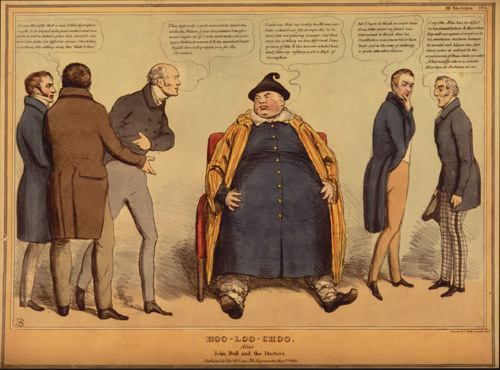 Hoo Loo Choo, John Bull and the Doctors, a satirical sketch. The Mystery of Lam Qua consists of a gallery of oil paintings with contextualizing metadata that document a series of patients seen by Reverend Dr. Peter Parker, an American Presbyterian minister and physician whose 1835 hospital in Canton, China attracted a wide range of patients. These patients often had severe or unusual cases of pathology that significantly altered (some would say deformed) their appearance. Parker hired Lam Qua to make portraits of these patients as a substitute for photographs, which had not yet been invented. This gallery represents selections from those portraits and offers a fascinating (if not disturbing) glimpse into the history of medicine in China.